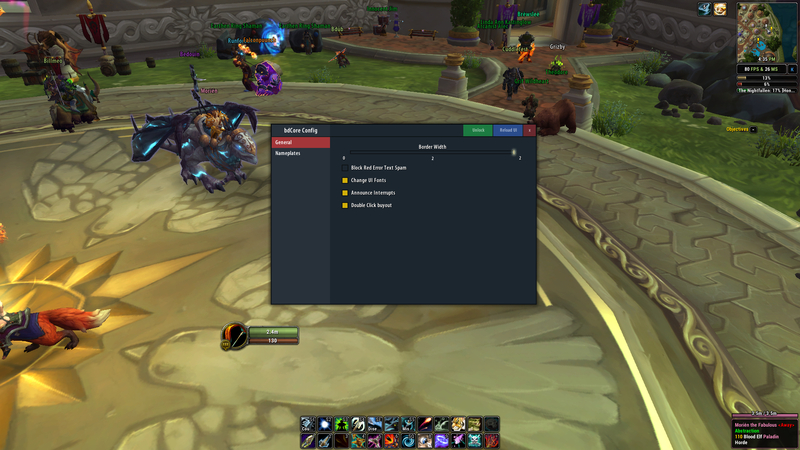 I'd love for an option to disable the party frame when using the unitframes addon since healers have their own frames and to have a toggle for buffs/debuffs based on player/target since right now it's all or nothing. Thanks. The bc_core file is missing in this download link, but instead downloads bd_unitframes! I went ahead and downloaded the proper core file from curse; switch it up so this site downloads the proper file. Thanks for your awesome contributions these addons are amazing! I tried to set focus to test and could not. I can live without it but wanted to let ya know. Would you be interested in these skinning updates? Let me know. I admire your work. Look great! PM me the code if you'd like, I'll add it in. Hi, which is the font name used on addon? Last edited by trivantim16 : 03-02-17 at 09:01 PM. Hey ive been using these addons for quite sometime and i really like them. But just wondering will their ever be a way to make profiles for different characters or is their a way already and im just stupid and haven't realized it. Because rite now however i set it up on one character it instantly becomes the same for the rest and i have always changed my UI according to my role tank dps or healer. Thanks for the bug report. For some reason I wasn't getting that error, even though I'm running the same version. No other addons loaded other than Bugsack, only running the latest bd addons that were updated today, aside from bdTooltips which is still 1.1 but disabled the results are the same. (*temporary) = "attempt to index field 'Aura Blacklist' (a nil value)"
Since the newest version i got this error. Everything works fine i think, don't know what it exactly means.